This Concept Cuda is a two-tone show piece representing the first release from a brand new companyRobert James Concepts. 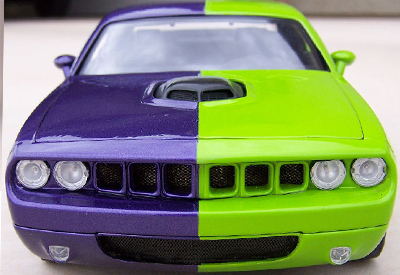 The RJC Cuda is a custom piece based loosely on Highway 61’s Dodge Challenger Concept, but as you can see, its been extensively reworked into something truly unique. 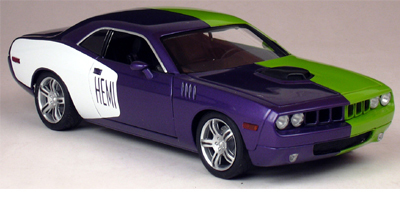 RJC notes that this is a car Chrysler should be building, but for now their 1:18 version will have to suffice. Differences from the Challenger are extensive: an all-new front grille and lower valence brings the look of the ’71 Cuda into the 21st century. The rear valence is also reworked to include a pass-thru exhaust. The roof and rear deck were rounded and re-contoured, and the rear quarter panels were shaved. One of the most distinctively “Cuda” touches is the Shaker hood scoop, which is nicely integrated into the modern hood. Just as novel as the car itself is RJC’s philosophythey’ll be taking orders for the car the way full-scale dealerships dooff an order sheet on which the customer selects the specific options. You pick the exterior and interior colors, the tire and wheel package, and graphics options. Future versions will also offer different engine and interior options as well. All of this won’t come exactly cheap, but it offers a level of personalization rarely seen in diecast. Each comes with a VIN corresponding to the car’s factory options, build-date, and order in the production sequence, as well as a signed certificate of authenticity. Check out http://www.robertjamesconcepts.com for more info or to place an order.